Baylor University's legacy encompasses over 170 years of tradition. The Official Baylor Ring is a tangible symbol of our university's rich heritage. We invite you to participate in this esteemed tradition that unites our alumni of the past, present and future. The Official Baylor University Ring is available exclusively to alumni and students who have completed 75 credit hours. The Official Baylor Ring symbolizes a remarkable achievement in the life of a student and marks the beginning of a new stage in your Baylor experience. The Baylor Ring Program provides qualified students the opportunity to purchase the Official Baylor Ring and to participate in the Official Baylor Ring Ceremony where rings are presented to students by the university president. Please note, March 8, 2019 is the deadline to order a ring to participate in the spring ring ceremony. 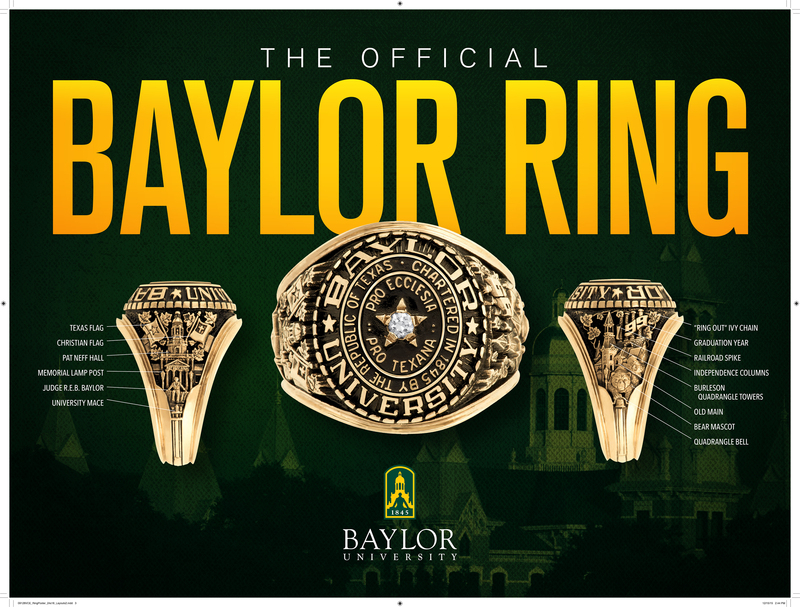 Effective December 2, 2015 participation in the Official Ring Ceremony will be reserved for students and alumni who purchase the Official Baylor Ring from Balfour. Please direct questions to BaylorAlumniPrograms@baylor.edu.